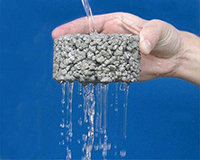 What are pervious pavement systems? Porous pavement systems offer commercial property owners/managers an environmentally-friendly alternative to manage storm water. 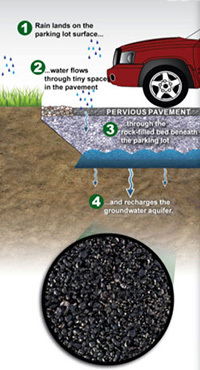 These pavement systems, used mostly for parking lots, allow water to drain through the pavement surface into a stone recharge bed and infiltrate into the soils below the pavement. These pavement systems were first designed in the mid-1970s. The recent changes in storm water regulations have prompted many consulting engineers and public works officials to seek information about them. 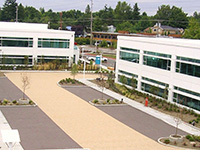 These systems can help your commercial property/corporate campus earn valuable LEED points. What can porous pavement systems do for your property? Porous pavements are of great interest to property and facility managers. 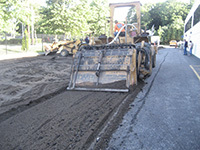 With the proper design and installation, porous asphalt can provide cost-effective, attractive pavements with a life span of more than twenty years, and at the same time provide storm-water management systems that promote infiltration, improve water quality, and many times eliminate the need for a detention basin. 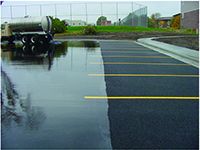 The performance of porous pavement systems is similar to that of other asphalt pavements. 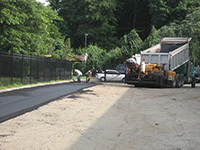 And, like other asphalt pavements, they can be designed for many situations. The technology is really quite simple. The secret to success is to provide the water with a place to go, usually in the form of an underlying, open-graded stone bed. As the water drains through the porous asphalt, concrete or pavers and into the stone bed, it slowly infiltrates into the soil. The stone bed size and depth must be designed so that the water level never rises into the asphalt. This stone bed, often 18 to 36 inches in depth, provides a tremendous subbase for the asphalt paving. Reduces or eliminates water runoff. Eliminates the newly mandated MSD storm water runoff surcharge. Allows for better use of land by reducing or eliminating detention basins. Protects streams and replenishes aquifers. For use with parking lots, streets, driveways, trails, etc. Reduces the need for concrete curb and gutter, along with storm sewers. LEED® credits available in three areas: Sustainable Sites, Materials & Resources and Innovation and Design Process. Can earn credits under the LEED® System. Has been shown to mitigate the urban heat island effect. Provides storm-water management systems that promote infiltration. Has a typical life span of more than 20 years. Underlying stone bed tends to absorb and retain heat so ice and snow melt faster with the porous mixture. We can also design a hybrid asphalt/concrete system where concrete can be used in your front parking stalls to prevent rutting & oil spill damage to your heavily trafficked front parking stalls and pervious asphalt used throughout the remainder of the parking lot. What Are Solar Reflectivity Coatings? The solar reflectance index (SRI) is a measure of a material’s ability to reject solar heat, as shown by a small temperature rise. Standard black is 0 and standard white is 100. For example, a standard black surface has a temperature rise of 90°F (50°C) in full sun, and a standard white surface has a temperature rise of 14.6°F (8.1°C). Once the maximum temperature rise of a given material has been computed, the SRI can be calculated by interpolating between the values. Or any other low speed asphalt traffic surfaces that would benefit from urban heat island reduction. Bio-based rejuvenators have been designed to protect new asphalt pavements from the effects of oxidizing and aging, which result in raveling and cracking. Older asphalt pavements can be treated and further deterioration delayed as long as the pavement does not fail structurally. 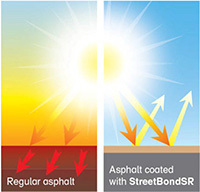 Bio-based rejuvenators have been uniquely formulated to improve penetration, viscosity and stability values of the treated asphalt. Since it is only mildly opaque (cloudy), line striping is still very visible after treatment. No sand is required since they penetrate deep into the pavement causing little or no friction value change. Additionally, the material is completely dry in 15–30 minutes depending on atmospheric conditions, reducing the amount of time a road or parking area needs to be closed. In-place recycling is useful for a situation where there is moderate–excellent sub-base material currently in place (i.e. 6” – 12” of solid stone base) and a thin layer of asphalt (1 ½” – 3”) currently in place. Asphalt Pulverization—the economical and efficient way to recycle parking lots in place. The flexible pavement and a pre-determined portion of the underlying base material are milled and pulverized to a depth ranging from (6 to 12 inches) or more. The pulverized material is mixed within the reclaiming machine while stabilization reagents (such as lime or portland cement and fly ash) and water are introduced and blended with the pulverized recycled paving aggregate. The reclaimer is then followed by grading, spreading and compaction equipment working in the same manner and sequence as if plant-mixed PSM material were delivered and placed at the project site.